Every year, technology is becoming more and more advanced and is constantly improving. These improvements includes improve enhanced functions in smaller and smaller packages. This is why 2.5” solid state drives and hard drives are becoming more popular due to its low power consumption and space-saving benefits, which are superior to 3.5” SATA hard drives in almost every category. Combine with the extra bandwidth of the SSDs and the raw power of the processors; enterprises are able to accelerate their project-development process. Since 2.5” SSDs and HDDs have smaller storage capacities compared to 3.5” hard drives, maximizing the storage density in limited spaces have become the most important task for many storage consulting firms; a task they are faced with often. The ToughArmor MB992SKR-B is designed specifically for systems with space limitations by fitting 2 x 2.5” SSD / HDD into a single 3..5” external bay. 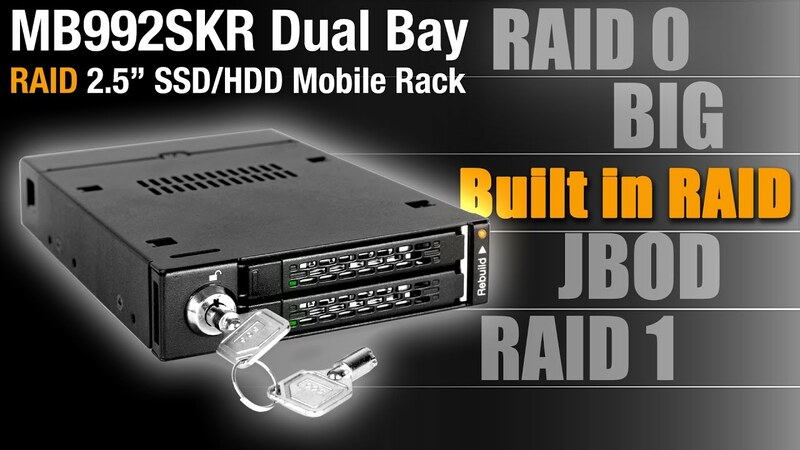 With its built-in high performance hardware RAID processor, the MB992SKR-B gives users the option to choose between RAID 0, RAID 1, BIG and JBOD modes. The built-in RAID function allows you effortlessly add a 2.5” SSD/HDD RAID array to any system without needing to add a RAID controller card. The MB992SKR features a rugged heavy duty full metal construction which is commercially suitable for medical & military systems, government agencies, Industrial PCs, SMB workstations, VM workstations, mobile DVR systems, aerospace computers, automation systems and embedded systems. Making sure your drives are in good hands and lasting as long as possible is carefully considered to any enterprise build and design, the MB992SKR-B is capable of holding up in the harshest environments, with the rugged heavy duty metal construction in the entirety of the body and its smaller components. It can be used various systems including: military and law enforcement deployment, as well as manufacturing conditions such as embedded control systems and factory automation systems.